Hostel is great, very very clean, staff very kind and helpful! Walking distance to city centre. really nice location in a great city! just the rooms could catch up a bit with the beautiful lounge and corridors! Great hostel! Nice place, near by a park. I had a great time there and when I comeback to Glasgow I will stay there again. Gute Lage: nah am Park, nah am Kelvingrove Museum und Studentenviertel (gute Cafes, Pubs und gutes Kino). Mit dem Bus schnell im Zentrum. Freundliches Personal. Tolle Lounge. Gemütlich. Great hostel! It’s located on a hill in a posh area with a good view. The inside seems more like a hotel due to the old building and the luxurious interior. Everything worked out fine. Tolle Wohngegend, nette Mitarbeiter und für ein Hostel ziemlich sauber und neu! Great location in Glasgow‘s West End. 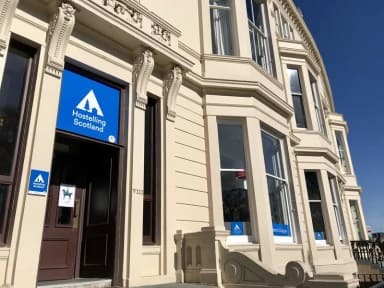 The hostel is in a quit (up scale) area within Glasgow‘s West End. 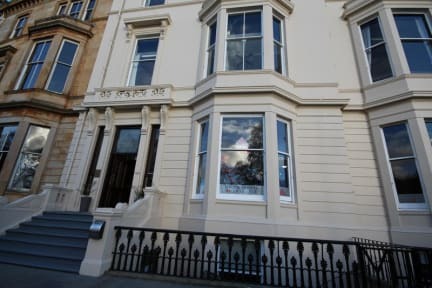 The Kelvingrove Park and the Ashton Lane are within walkable distance. Die Lage ist gut und nah am Stadtzentrum. Das Zimmer hat uns allerdings gar nicht gefallen. Sehr eng, die Betten waren extrem unbequem und es hat ziemlich unangenehm gerochen. Die Küche war in Ordnung. Würde es aufgrund des Zimmers aber nicht weiterempfehlen.